The Broward County PBA maintains a police memorial to honor Broward County’s fallen heroes. The memorial is located at the BCPBA offices and may be visited during regular business hours. The mural, painted by Stephen Williams, son of Dave Williams, a retired lieutenant from Sunrise, was inspired by the National Law Enforcement Memorial in Washington, DC. 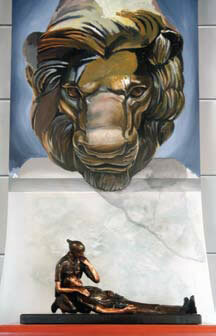 It features a rendering of one of the lion statues from the national memorial, meant to symbolize courage and valor. Also featured in the BCPBA’s memorial is a replica of the “Officer Down” statue that was commissioned by the Florida, Dade, Broward and Palm Beach PBAs and stands in Capitol Plaza, the site of the annual state law enforcement memorial ceremony. The wall bears the names of Broward County law enforcement officers who have been killed in the line of duty, along with the inscription, “It is not how they died, but how they lived.” Work on the mural began in October 2009. Below is a list of Broward County’s fallen officers. Click on the officer or deputy’s name to view their profile at the NLEOMF website.